I still seem to be insanely busy since I came back from France so thought I'd post an old favourite I haven't made for a while which comes from my book Meat and Two Veg. Since you can now buy it for 4p on Amazon (how humiliating is that?) I might as well give it away. Do use good quality beef for it - the traditional skirt is perfect. And don’t be tempted to put the veg and meat through a food processor. They really are better chopped by hand. Measure out the margarine or butter and lard, wrap each piece in foil and place in the freezer to harden for at least half an hour. Cut the beef into very small cubes, put in a large bowl and mix with the Worcestershire sauce. Cut the swede into similar sized cubes, quarter and finely slice the potatoes and finely chop the onion. Add the vegetables to the meat, season well with salt and pepper and mix well. Measure the flour into a bowl and grate in the semi-frozen fats, dipping each block into the fat as you go. Cut the fat into the flour until it resembles coarse breadcrumbs then sprinkle over 4 tbsp of the iced water. Work in the liquid with a flat-bladed knife, adding enough extra liquid to enable you to pull the mixture together into a ball. Put the pastry onto a floured board, shape it into a flat disc then place in a plastic bag and chill it in the fridge for half an hour. Preheat the oven to 200°C/400°F/Gas 6. 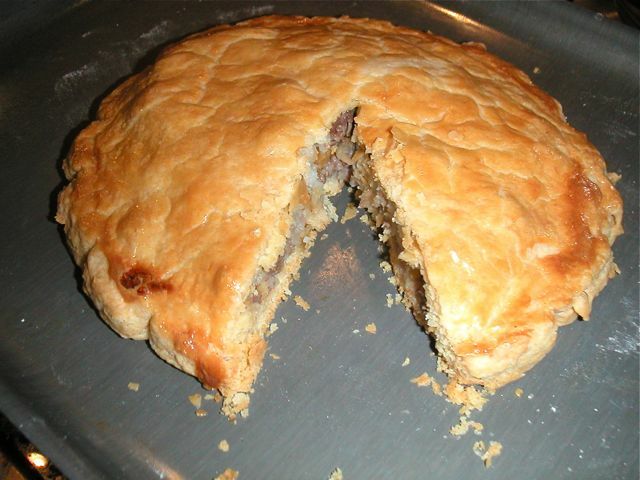 Grease the inside of the pie dish lightly with margarine or butter, tip the filling into it and pack it down well. Moisten the rim of the pie dish with water. Roll out the pastry to a circle slightly wider than the diameter of the dish and carefully lay it over the meat mixture. Press it down lightly inside the rim and trim off any overhanging pieces with a sharp knife. Cut a slit in the centre of the pie and brush the surface with the beaten egg. Decorate the pie with the trimmings if you feel inspired. Bake the pie for 30 minutes then turn the heat down to 180°C/350°F/Gas 4 and bake another 30 minutes. Remove from the oven and cool for at least 30 minutes. Serve warm or at room temperature with a simple green or mixed salad. There's been a bit of a ding dong on Twitter over whether I should have called this Cornish Pasty Pie. Two Cornishmen (well, one man, one woman) were outraged but my argument would be that it's a pie with a Cornish pasty-type filling - hence the name. What do you reckon - and what would you call it? I've been meaning to post this for about a month but events have overtaken me. First landing the Guardian wine column which meant a frenzied few days tasting before going away on a long overdue holiday to France. I was going to blog there but managed to get sidetracked by visiting winemakers. I suspect this will be the story of my life for the next few months. Anyway, pig's cheeks. Or rather pig's cheek. 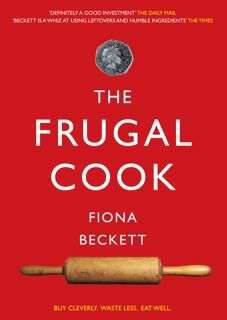 I found one on sale (below) at Source in Bristol for around a fiver I seem to remember and having never cooked one thought I'd give it a go. 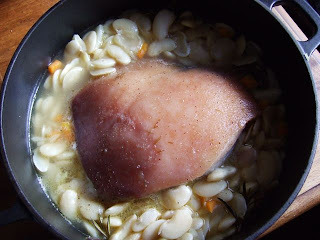 I was a bit disconcerted to find that one of the recipes I looked up called for more like a dozen cheeks which would have made it about as expensive as fillet steak so decided to give my solitary one the pork and beans treatment following a recipe I'd been given by a friend for hand of pork. 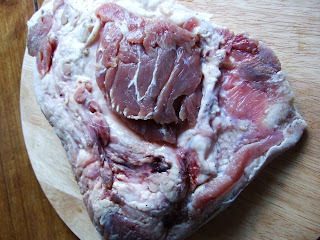 The boys at Source suggested I brined it first which I did but am not convinced it made a huge amount of difference*. The end result was pretty tasty but there was so little lean meat on the cheek that it was more like a pork-flavoured dish of beans. To satisfy the average healthy male appetite I think you'd need at least a cheek per person which really negates the idea of pig cheeks as a cheap cut. Put the beans in a large bowl of water and soak overnight. Put the ingredients for the brine in a saucepan and heat gently until the salt and sugar have dissolved. Bring to the boil and cool. Immerse the cheek in the brine for at least a couple of hours. Pre-cook the beans in a large pan covered generously with clean cold water and boil fast for 20 minutes. Don't add salt. Drain but reserve the liquid. Very finely chop the onion, garlic and carrot or blitz in a food processor. Heat a large casserole big enough to take the pig’s cheek, add a couple of tablespoons of oil and cook the finely chopped vegetables until soft. Add rosemary and/or thyme to taste - if you have sprigs then use these, if not, dried herbs will be fine - and plenty of black pepper. Place the pork joint on top - with a bit of oil rubbed onto the skin and season with sea or rock salt. Put the roasting pan in the oven and roast for about 3 to 3 1/2 hours. (Mine took more like 6-7 hours) Check every now and then that there is enough liquid in the beans - add more stock/white wine if needed. Serve straight from the roasting dish in the middle of the table - the pork will be best cut into chunks rather than trying to slice it. * Not that I'm against brining. I've brined pork chops to very good effect. 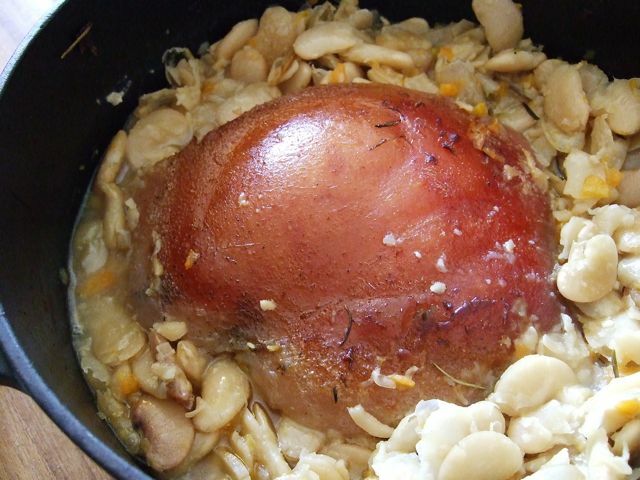 Have you ever cooked a pig's cheek/s and if so how did it go?